Originally Published in FreedomWorks For America by Casey Cheap on 8/31/15. Our awesome volunteers helped us run the booth during the duration of the day. FreedomWorks for America came out with strong support for Senator Mike Lee, for repealing Common Core and for pushing against the expansion of Medicaid in Utah. We also gave out several hundred educational materials on justice reform. FreedomWorks for America gave away more than 3,000 “I Like Mike” bumper stickers, 500 yard signs, 500 rally signs and thousands of lapel stickers. 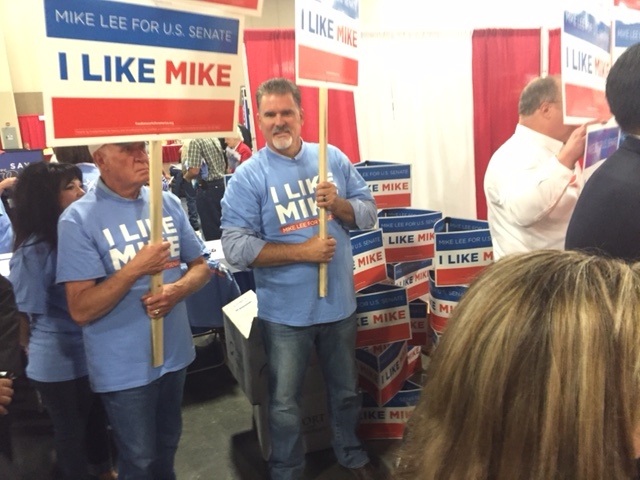 We also went through 500 of our “I Like Mike” t-shirts before 10 a.m.
“U.S. Senator Mike Lee received the loudest ovation of the event, making it very clear that Utah delegates approve the work he is doing in Washington, D.C.,” said Utah activist, Arturo Morales.